A dog that caught my eye while waiting for Diane to come out of the visitors’ centre at the end of our visit to the Cliffs. Trinket, t-shirt, CD, etc. 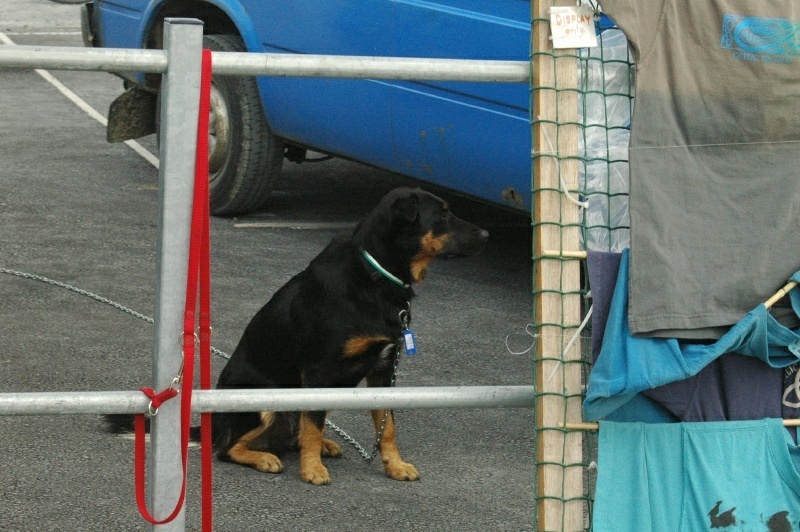 vendors are plentiful there, and this dog evidently belonged to one who had set up shop right by the ramp out of the centre. I don’t really know what caught my eye about the dog, but I liked him on sight. In an odd co-incidence, we saw the dog again later, in the evening of that day, in the parking lot of our hotel away back in Ballyvaughan. There was no doubt it was the same dog: same lengthy chain, same owner’s van, same blue tag, and same odd appearance of its left eye (which doesn’t show up in the picture.) We never saw its person, but it was an extremely friendly mutt, and was distressed to be left alone.